Four years ago, the movement Tania Cameron started was Rock the Indigenous Vote. This year, there’s a qualifier for the federal election: Rock the Indigenous Vote for the NDP. Motivated to get rid of Prime Minister Stephen Harper and the Conservatives in 2015, Cameron is now motivated to get rid of Prime Minister Justin Trudeau and the Liberals this October. “For me, personally with this Rock the Vote, and I’ve thought about this for months….and I decided this year I’m going full partisan for the NDP and I’m going to do all I can to engage First Nations voters in support of the NDP,” said Cameron. That’s not a stretch for Cameron who ran under the NDP banner in the Kenora, Ont. riding in the 2008 and 2011 federal elections. Both times she was defeated by the Conservative candidate. In 2015, like a good part of the country, Kenora went Liberal with Bob Nault becoming the Member of Parliament. However, four years later, failed promises on implementing the United Nations Declaration on Indigenous Rights for People; lack of consultation with First Nations in developing a legislative framework; the SNC-Lavalin controversy and the shuffling of Jody Wilson-Raybould from the Attorney General and Justice Minister Cabinet post, and then her eventual resignation from Cabinet; the jettisoning of Wilson-Raybould and MP Jane Philpott from the Liberal caucus; the fire has been re-lit in Cameron. “I’m going to be talking about the merits, the plans of the NDP, what we can do, what we have done in parliament for our people,” she said. Those accomplishments include the hard work undertaken by NDP MP Romeo Saganah with Bill C-262 aimed at ensuring Canada’s laws harmonize with the United Nations Declaration on the Rights of Indigenous Peoples. Late last year, Cameron met with NDP leader Jagmeet Singh. 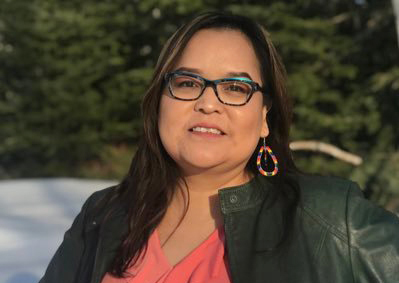 “I said I’d be prepared to support the NDP and tell First Nations communities why my personal values align with the NDP values, why I can’t support the Liberals, and the Conservatives aren’t even an option,” she said. The sprawling riding of Kenora includes 42 First Nations. It was because of the high number of First Nations and the changes the Conservatives made in the Elections Act that Cameron started Rock the Indigenous Vote. The “Un-Fair Elections Act” as she called it made it onerous for First Nations members to vote, with proof of residence a requirement and often difficult to obtain when a number of adults share the same residence, but the utility bill came in only one name. So Cameron started a non-partisan movement that trained people to help First Nations get over the hurdles in order to vote. “I toyed with the idea of doing this just as a riding association, but to me it was a bigger issue than just a partisan issue. I had all parties asking me for the information. I told them they could use it if your intent is to engage the Indigenous voters, that I don’t want logos on it or to push party platforms,” she said. She recalls the Assembly of First Nations included Kenora as one of the top 10 ridings where First Nations voters could sway the outcome. Because of movements like Rock the Indigenous Vote, a growing anti-Harper and anti-Conservative sentiment, a concerted effort by the AFN and National Chief Perry Bellegarde, and a strong leadership debate performance by Justin Trudeau, First Nations voters came out in record numbers. A number of polling stations in First Nations communities across the country briefly ran out of ballots on Election Day. Cameron also recalls that leading up to the vote, Thomas Mulcair and the NDP had been the Indigenous party of choice. She wants to make the NDP that choice again and doesn’t think the AFN’s relationship with the Liberals or concerns that Bellegarde often trumpets Trudeau will be detrimental to her cause. “I think whoever is at the helm of the AFN, they have to work with whatever government is in place,” she said. Cameron admits it will be an uphill battle for the NDP to form the next federal government. Singh only just won a seat in the House of Commons with a by-election victory in the Burnaby South riding in British Columbia. “One of the things that I’ve been hearing… (is that) Canada is not prepared to elect a brown leader, a person of colour. I thought that’s really unfortunate and we know what that’s like. I’ve had struggles in trying to be a leader, to get elected as a candidate. I’ve seen racism in my riding. I imagine Jagmeet Singh has expected it and we hope the better part of Canadians will decide that this is a party that is standing up for them in parliament,” she said. Singh is Sikh. The only time Canada has not had a white male prime minister was for the four months Kim Campbell served in the position. However, Campbell was not elected by the general public. She was selected by the Conservative party as Brian Mulroney’s successor. As Mulroney was prime minister when he retired, Campbell took over. Cameron is hopeful the NDP could at least hold the balance of power if a minority government is formed. Earlier this week, Cameron was in Toronto at the Chiefs of Ontario assembly. Federal election talk did not dominate the room, but she says she did have important “side discussions” with chiefs who are vocal on social media about federal politics. Cameron is hoping to work with some of the same people she trained in 2015 to get out the Indigenous vote. “I still want our people to vote. I prefer NDP, but I’ll still help them. If they want to be non-partisan, that’s fine,” she said.